One way or an other these sketches looked primmising. remember: amateurs built the ark ..
push it a bit further and build a cody!? I've seen the resemblence, but A cody is a cody. there is a cody variant if i remember correctly that has the front cells not square, more trapezoidal like in your drawing. It is going to look awesome no matter what! There is a cross-wing Cody variant that is similar but I couldn't find any shots of it. Your rear section is similar to the Compound Cody, that's a shot of Bob & Charmayne Umbaur's (think I got the last name wrong). Your addition of that cross and the third wing adds some structure to the framing and using the simpler triangular wings gives it a more graceful look like the Ichiban, and the continuous sail rather then separate front & rear sections is another nice feature. Kinda looks like an Ichiban. Thanks for a big compliment. I used to make kites with simylar shapes of paper and wooden rods. Seeing the Ichiban stirred up the slumbering fire. Ok - I'm in. I like it. 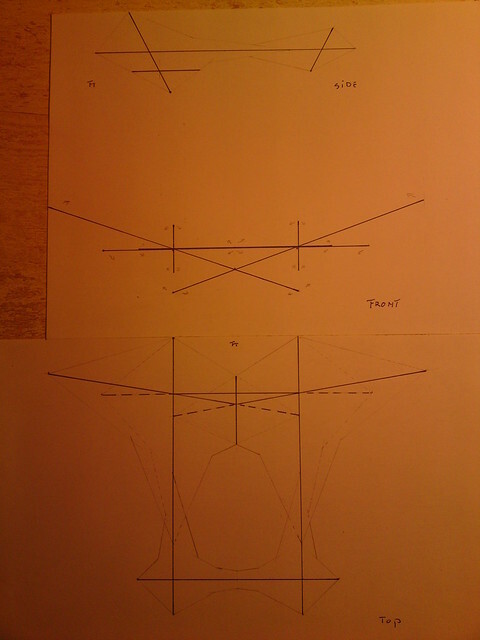 Can I get a hi-res version of your pic of the hand drawn templates for the mock-up (the one with the angle drafting tool in it) so I can build a 3d model on CAD and get a better look/feel for it? That's how I'm the most comfortable with "getting to know" a kite. I, personally, don't see the Cody connection. I can see the Ichiban reference, though. Im scanning it right now. About "Cody like" looks: I guess the upper wing add a little to that idea. I'm not going for the Bat-shaped wings, but will be trying to keep it a little more simple. 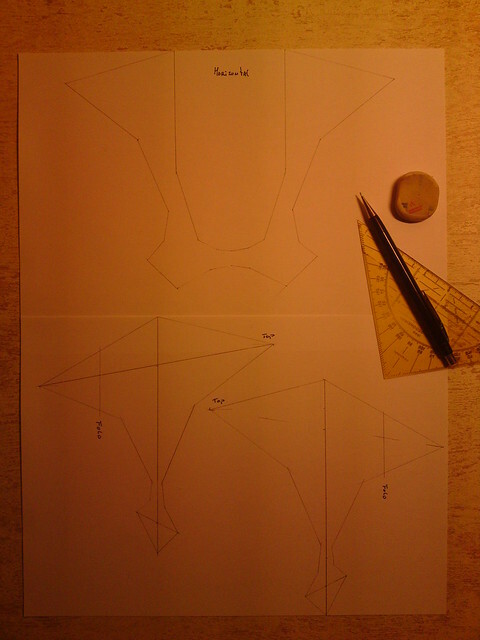 A unusual detail will be, that the upper[front]wings are ending in the vertical upper tail piece. Comming in one piece this part of the sail will show a little twist. I'll work on a mock-up tomorrow; it's DVD night with the kids tonight. Here's a 3D drawing , that Fore Check made. Guess i'll have to build it now. going to order fabrick and rods . . . . .